You've probably learned by now that great (and free) online guitar lessons are far and few in between. This list results from a compilation of the top 30 guitar learning websites on the net as of November 29 2016. Most websites were not good enough to share. The goal of Hub Guitar (yes, you are here) is to become the go-to resource for learning essential guitar skills such as technique, fretboard awareness, and more. If possible, try to avoid crowd-sourced tabs and chord charts as the quality is often lacking. You get what you pay for. Most official songbooks and published sheet music are much more accurate, and include not only tab and chords but standard notation as well. There are many available on Amazon. Books are strongly recommended over online tabs, wherever possible. Songsterr includes a fairly well-selected list of songs. The tabs are not perfect but they are reasonably accurate, and the software on the website allows you to see the tab move by in real-time. This is the most reliable source for accurate guitar tabs on the Internet. 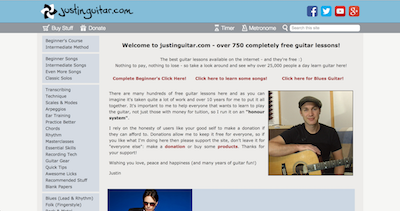 Justin from Justin Guitar is one of the leading guitar teachers on the Internet. By this point he’s covered nearly every popular song you could want to learn, so check out his website and YouTube channel. 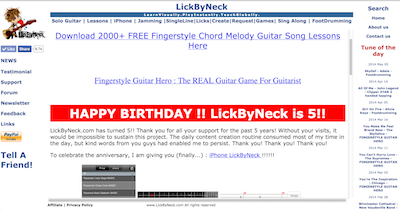 Lick By Neck is an incredible website. Although the user interface and programming side of things could use some work, there is an incredible amount of material here. Hundreds of standard jazz, latin and pop tunes arranged into solo fingerstyle arrangements, with videos, recordings, tab, and even playback software to learn the songs. One of the best kept secrets of the guitar-learning internet. For classical tablature, check out Classtab.org, a sizable repository. For standard notation in the public domain, visit IMSLP. For both of these, be prepared to do a bit of digging and don’t assume that everything is accurate. 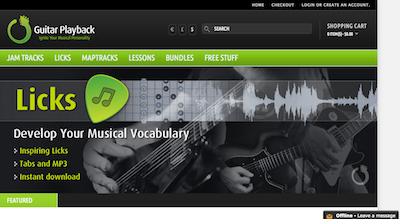 Guitar Playback — probably the best website out there for general-purpose jam tracks. Each jam track comes with the chords and some suggested scales. All jam tracks are performed and produced professionally. Highly recommended. 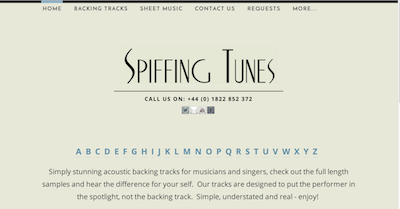 Spiffing Tunes — an excellent resource for backing tracks for standard tunes and other popular songs. YouTube is still one of the best places to find backing tracks. Just enter in the search bar the words “backing track”, and either a style, a key, or both, and you should find quite a few. 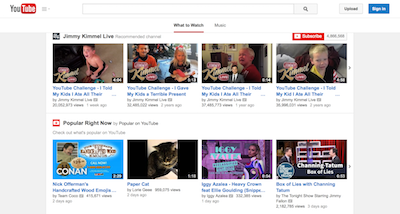 Pro Tip: some people are using websites and special tools to download mp3’s from YouTube. No links to such tools are provided here, because that’s a little naughty, but do what you may with the information. These sites didn’t fit into the above categories, but merit mentioning. Guitar Chalk is a personable and attractive blog that is frequently updated with useful information and resources for guitar players. Worth a follow. 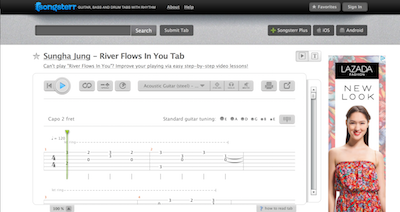 SongNotes comes with an appealing pitch: hand-selected guitar tabs, curated with care. If the internet sometimes seems like a flood of dirty guitar tabs, websites like this one come across as a small bottle of pure spring water. 52 Weeks of Blues offers another appealing pitch in a time of information overload. Focus on one blues song per week and by the end of the year you’ll have quite an arsenal of tunes. Classical Guitar School of Iceland, an amazing and abundant collection of beautifully arranged and engraved music for classical guitar. Also includes some other music like folk and ragtime. Wonderful for building sight-reading skills. BluegrassGuitar.com - a wealth of information about bluegrass guitar. Note: These resources link to external websites over which Hub Guitar does not exercise control. Clicking some of the links above may result in Hub Guitar being compensated should you make a purchase.